Choosing a Wedding Gown That's Right For You! When it comes to choosing a wedding gown that’s right for you it has to fit into your overall wedding theme and setting. So it takes careful planning in order to pick the right dress! Like most brides, you probably went to the nearest magazine stand and bought the latest bridal magazine. But you may ask yourself, “Will I look the same in the wedding gown as the model?" Good question! In most cases the wedding dress "will not look the same on you," unless you have the proportions of a model. Plus sometimes those pictures are touched up! Even though it may seem that designers promote one basic style silhouette, there is no such thing as “one style fits all,” especially when it comes to wedding dresses. The strapless neckline has been popular with designers now for over 15 years. It may look good on one person but not on another. Make sure you buy what looks good on you, not what is currently popular! The right wedding gown will emphasize the positives of your figure and hide the negatives. How can you find it? By doing the preliminary research and planning needed before going shopping for your gown. Get this right and you won't have to be like some who end up with 2 or more wedding dresses, because of making bad choices. Imagine the frustration, waste of time and money lost! If you have a question or need wedding dress advice, I invite you to fill out the form below. The questions you post on the form below is for a public forum. If you have a question and want private help then use my contact me form. "Thanks for taking the time to make a contribution. Your efforts will certainly enrich this website and be helpful to others.!" If you get the answers to these things first before heading out to shop for a wedding dress... you will be most likely be successful in finding the perfect wedding dress for you. Do You Need Some Wedding Dress Advice? Would you like to receive or give other brides, wedding dress advice? 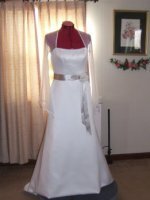 Perhaps you have tried on a few wedding gowns on and would like advice as to which wedding dress looks the best on you. Then please feel free to share your questions, comments and tips here! Help! Does anyone know the original designer of this dress? Can someone tell me what the name of this Maggie Sottero dress is? I bought this used dress that was designed by Maggie Sottero. Does anyone know the name of it? Please and thank you. Dress Color Change - Can A Dress Be Dyed? My lilywedding.com Wedding Dress Is Too Short! Are You Looking For A One Shoulder Wedding Dress? Need To Find This Wedding Dress! Backless Wedding Dresses Need Help Finding Very Low Back! Can You Help Find Me A Wedding Dress?? ?